Dinner on my first night in Singapore was at Putien, a Fujian-Heng Hua restuarant in Marine Parade. 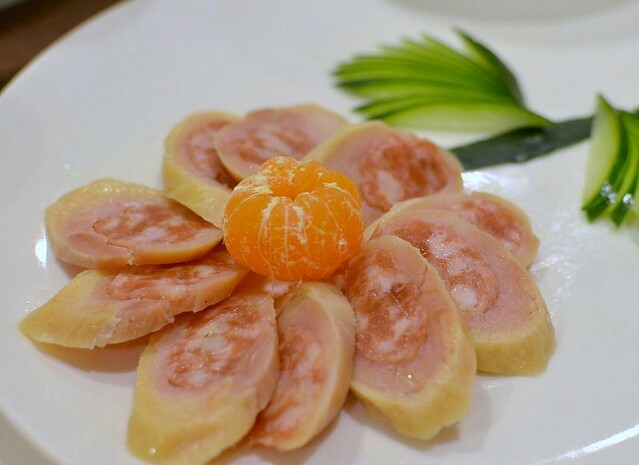 I'm not familiar with Fujian cuisine and found it similar to Cantonese cuisine. I found Putien's dishes at par (albeit some misses) with the fine restaurants in China and the elegant, modern Chinese decor very pleasant. Not sure about the prices though because the tab was picked up by Hub's cousin. Thin belly pork slices with a garlic soy sauce. 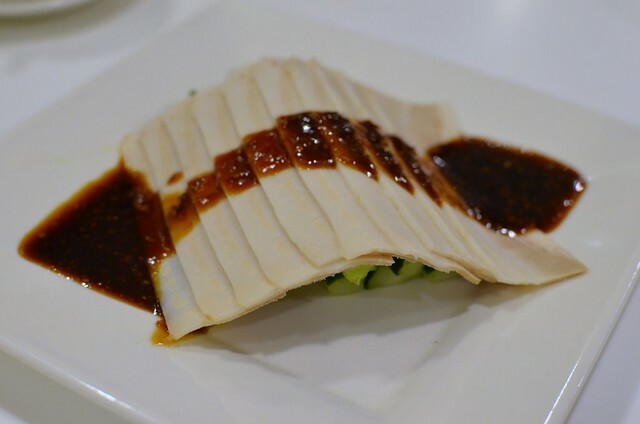 The pork slices were so thin that it was hard to tell whether it was pork or imitation meat. Though tasty, this was too delicate a dish for me. I want my meat to taste like meat. 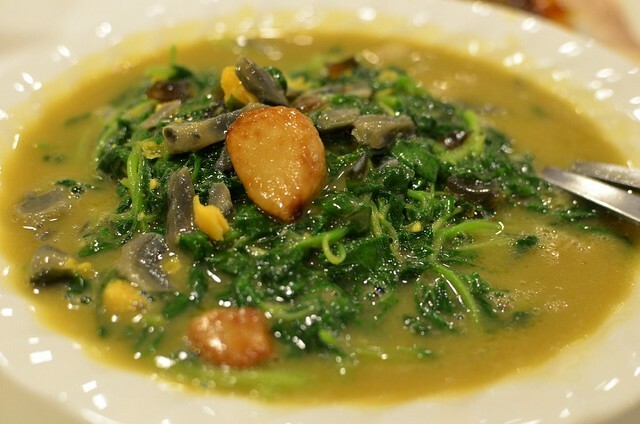 This is one of Putien's best dishes, tender spinach in a rich sauce of three types of eggs: century egg, salted duck's egg and chicken egg. I'm not sure about this version of 3-egg spinach which though very tasty and flavorful, was rich and creamy compared to the common version where the sauce is lighter and clearer. The spinach was also slightly bitter. Oh chien or baby oysters omelette is one of the greasiest but yummiest dishes you must feast on in Singapore or Kuala Lumpur. 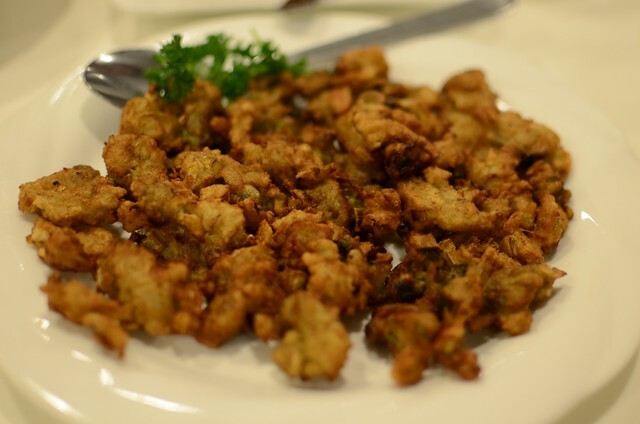 This deep-fried version is dry and boring. I've always disliked Singapore lor mee, noodles in a thick gummy gravy but Putien's version was different and delicious. 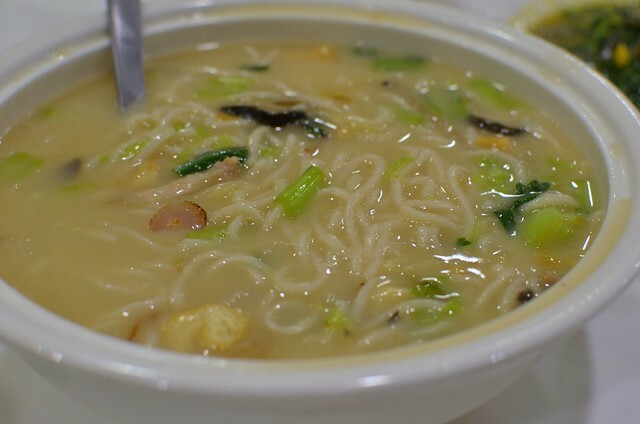 The soup was rich and very tasty, slightly thick and the noodles just the right texture. 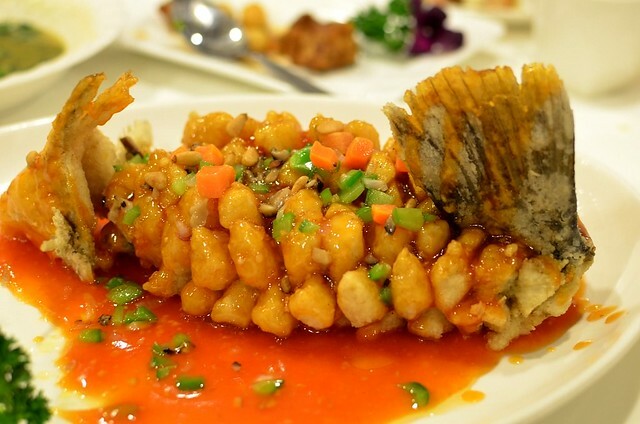 This dish of sweet and sour fish was perfect, the sauce just nice and the fish delicious, superfine and fresh. I love taro, and one of my dining companion commented that taro is a ladies' favorite and I think he's right. The or nee (taro paste) was lacking in taro flavor. 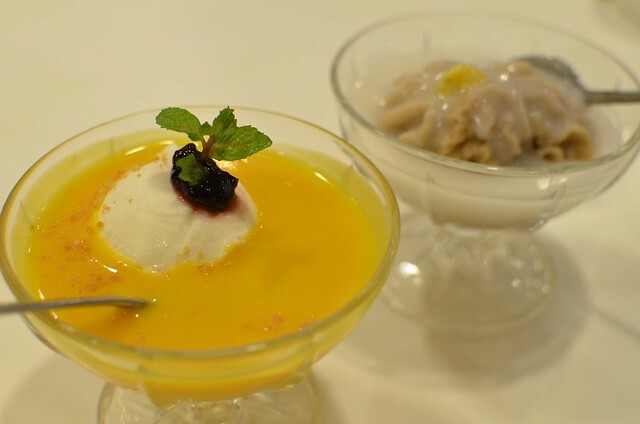 The pumpkin dessert can be improved by using deep orange-colored mature pumpkins. Still, nice change from the usual red beans or peanuts and I enjoyed the coconut ice cream. This was AF's breakfast the next morning at a stall behind a mall in Katong. I've noticed that char siew in Singapore is always lean and dyed orange-red, like the char siew in Kuching. A no-no for me. 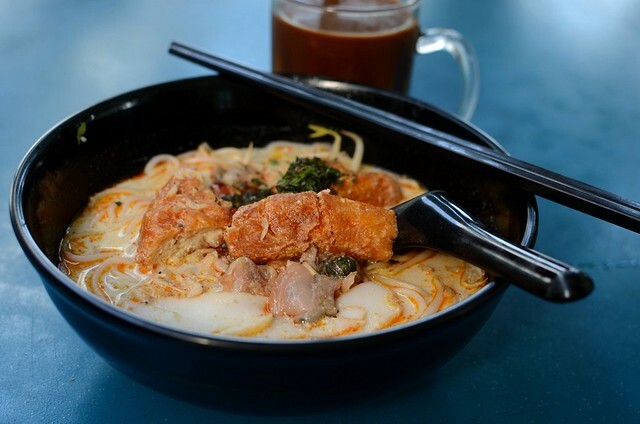 I didn't try B's noodles with stewed chicken feet and mushrooms because I was saving my stomach for my first bowl of Singapore laksa in nearly 3 years. The cockles were big and raw, the noodles el dente and even though the soup was too thin and lacking in deep flavor, I walked away very contented. Maybe because it was my first day in Singapore but the economy buffet dishes looked better than those in KK. I was in Singapore to meet up with Tina but our schedules didn't allow us to spend much time together so Tina suggested that I go to her mom's apartment for lunch. 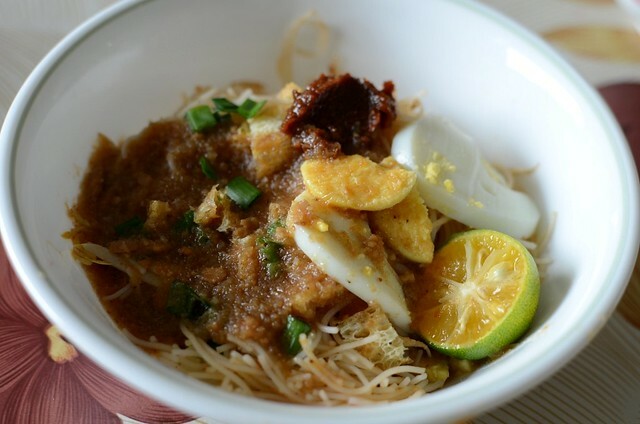 It's always a treat to eat home-made mee siam. 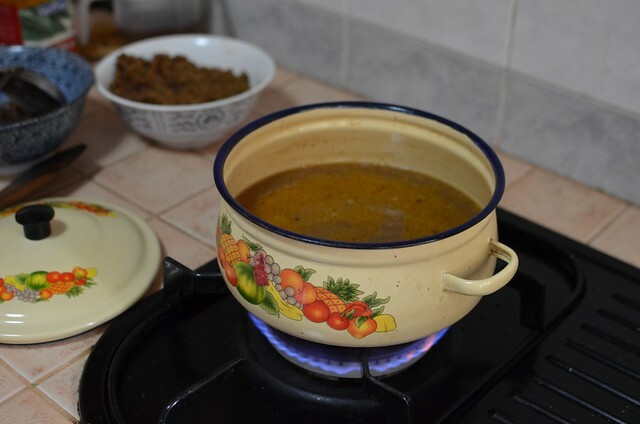 Everything, from the gravy to the sambal, was home-made. So much work--that's why I've never cooked mee siam. 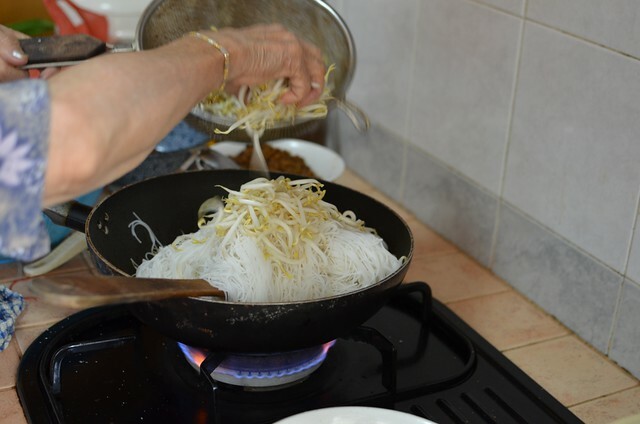 Tina's mom's delicious nyonya-style mee siam is a more sour and lighter version than the mee siam I'm used to. 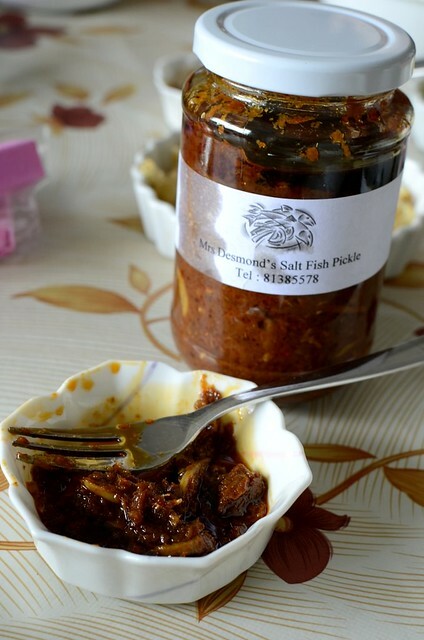 A bottle of home-made salted fish, either straits Eurasian or nyonya-style. Reminds me of mango chutney, only this was better. I'll have to get my brother to bring this for me. 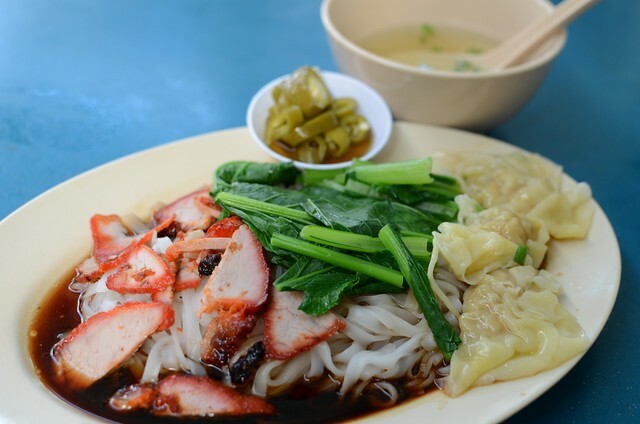 pu tien is one of my family's favourite restaurants to go to for festive occasions, but maybe you chose the wrong dishes ): enjoyed looking at your travel photos in singapore! yum laksa!! char siu in hk is the best! shuhan: oh i did enjoy my meal and def will eat there again. yes yes laksa's yum yum yum! michelle: i hear toronto has the best char siu. we get pretty good char siu here too, charred n fatty. 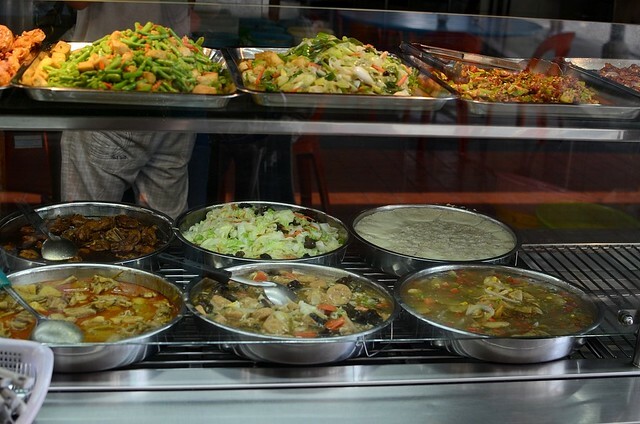 Oh, some of the presentations at economy rice stall are so good (especially if you go just before lunch or dinner crowd moves in), you really want to order everything! There's great char siu in Kompleks Karamunsing. blurting: agree. so high standards oh singapore. 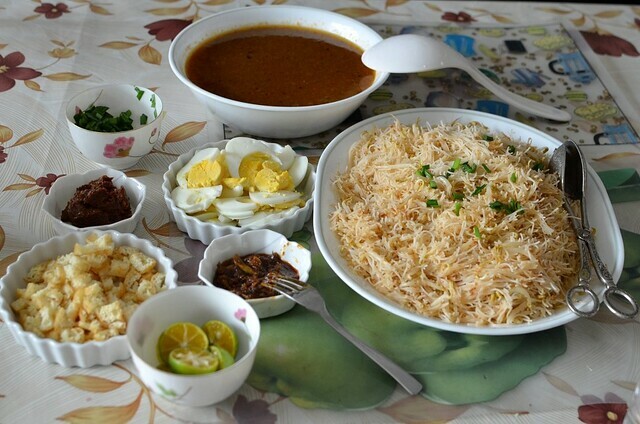 OMG..my Husband untie is Eurosian..i like her salted fish pedas..